A non structural exterior grade smoothing compound for use in light to medium duty applications to smooth and level rough or mechanically damaged concrete or sand / cement screeds that have become worn, impact damaged or weathered, such as balconies, patios, garages, walkways etc. It is unaffected by rain or frost when set and dried. It is also suitable for smoothing subfloors prior to the application of a suitable finished non-slip coating or external covering such as artificial grass. 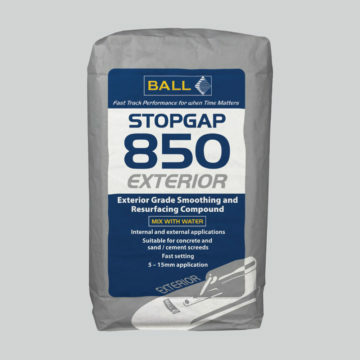 STOPGAP 850 is also suitable for internal applications over damp, uneven concrete and sand/cement screeds, prior to application of STOPGAP Waterproof Surface Membrane or ISOLATOR MEMBRANE.